However my dear friend Daxda was kind enough to find a new way to do it and he re-wrote the tool in a more error-tolerant manner, that I believe should work for much longer than mine. Right now it’s still in development stage but it works more or less and is very simple to use. It’s called “PB Shovel” (https://github.com/Daapii/pb_shovel). The directory the extracted images getting saved in. 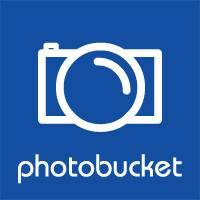 which is hosted on Photobucket. --images-only         Do not download any other filetype besides image. --videos-only         Do not download any other filetype besides video. The matching password for your account. To run it, you will need 2 libraries called “Requests” and “BeautifulSoup”, both for your convenience been uploaded here, simply extract the archive into the “PB Shovel” folder and done. Edit 2014.04.17: added an option to skip existing images. They will be skipped if image names match. If that option is not set then the script will not replace or skip images. To skip images just add “–omit-existing” to the command line. Edit 2014.04.07: lots of things have changed and a lot of things have been added. It’s now more functional than it was. Supports downloading from your own account, downloading locked (private) archives, you can choose what types of files (video or image) to get and download whole albums, including sub-albums. If it breaks again, it would be very helpful if you could share the album URL so we could see for ourselves. I had to install beautifulsoup4, but it seems to be working now (both using a single link, and with a file listing 4 links)! Hooray!! I noticed your script is not downloading the original size of photos. By the way, the extension I made has a free version. AFAIK PB already has an album downloading feature, however only for your own albums. Hi just stopped by to say thanks, you just saved me hours of boring work. Any way to skip already downloaded images? Added an option to skip existing images. They will be skipped if image names match. If that option is not set then the script will not replace or skip images. To skip images just add “–omit-existing” to the command line. Does PB Shovel work for albums that are private and don’t have input form for password? Do you have to get password for private albums? Just wanted to say “thanks” where it’s due. In this case, it’s thanks to YOU (and “Daxda” maybe) for leading me to how to login to guest-pass protected albums. I hadn’t really been sweating it much since most people tend not to have guest passes to use. But it’s a nice feature to have either way. Oh, and if anyone out there DOES have the hacking wizardry skills to crack private albums and is interested in being buried in money, feel free to click on my name above to go to my home page and click on the “Contact” button. My old hacking partner decided to take his ball and go home (immigrated to the US and left bucket hacking behind). So I am searching for a new partner. So I couldn’t actually get this to download any private albums. It would connect and all that but it would just say download files 0/0. I tried a bunch of private profiles but no luck. Does it no longer work? Any words on an update for this problem of 0/0 downloads? If I may ask how are you invoking the tool? obviously to download a private album you need to provide a password for it. And to download a completely private album, you need to use -n (username) and -p (password) switches, otherwise you get the same 0/0 issue. My old one doesn’t work AFAIK, however this one (PB Shovel) was working last time I checked. Try it and see. I wrote that at the very end of the post… You have to be completely clueless if you can’t understand from here. Would be nice if you posted those syntax errors so I can help more. Btw, The author of this tool has deprecated it and I’m afraid but he’s no longer going to work on it :( however it should still be working? Wish I could help more but I’m not a tech person to be honest. One of the first times I’m using the cmd line to do anything. 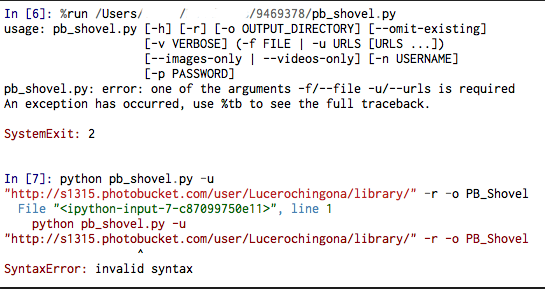 I installed python fine, According to your last post I should input this into the command line [python pb_shovel.py -u “http://photobucket.com/example” -r -o PB_Shovel] substituting of course, the actual photobucket address I want to use. It says file (stdin) line 1. With Python you also need to install 2 other libraries, that might be the cause. I repacked those libs for convenience, you can download them from here and extract that to PB Shovel folder. Still can’t get it to work. I’m working on a mac and I downloaded canopy. Then I opened shovel. In the top box I get a bunch of code and in the lower box is where I can type in the request. I have one folder inthere I have the file pb°showel.py and I have 2 folders bs4 and request. Then you have a flawed Python installation. Reinstall and try again, using Python 2.7. Is there an argument to download full size files? I’m only getting the compressed versions. I can click through on the webpage to the fullsizes. Thanks. Uhm… AFAIK it gets full-sized pics, if not then too bad. I’ve actually read and followed your instructions quite a few times. I always take my time to read over and I’m still stumped. I have installed the libs into the folder and still cant get it. The problem here is that you launch the interactive Python shell before running the command… Don’t run python, just paste that command. Also you have Python 3.4, when I said it over and over that you need Python 2.7. Un-Installed 3.4 and Installed 2.7. Just an FYI, this tool isn’t for completely clueless people. At this point I’ll tell you to RTFM, please, if you can’t figure this stuff out. Sorry. I did say earlier I had never used command prompt before, but I figured out what you meant. It’s now working, but I did not read the comments previously where people were 0/0 downloads out of private photobuckets without the password. But thanks for your patience. Much appreciated! Then Collected links: 48″… Then 72… And so on. The problem is that is goes forever. It never seems to find the end of the album even when it passes the 290 mark (which is the 273 images plus the 17 videos). It never stops. It will then download the entire thing — so it “works” — but it just gets confused once it gets past the 290 actual files. ‘page’ is not recognized as an internal or external command. Basically, it looks like it gets confused looking for some keyword and then eventually tries to actually execute the word “page”. Also, taking a quick look at the code, it seems to be looping looking for “end of album” to exist in the HTML. But, looking at the PB source, I don’t see that that ever occurs (which would explain the endless looping). Maybe an update is needed? EDIT: Upon further review, it looks to me like it actually only does the FIRST page of downloads — then tries to do them over and over again. So, something is definitely broken with the paging — it doesn’t find the “next” page to get more images — and it doesn’t find the “last” page to know when to stop looking. Maybe you could give it a go MTAK? :) clone the project from github. Hi, I ran into this webpage because I have been trying to grab files from an account that I own for several months now. After intense research and many, many, manyyy requests … STILL no success and/or replies from anyone I have ever contacted. However, I did find a way to view some of my files (the method is unknown by the public). My account was private from day #1 with the “filename scrambler” feature enabled to avoid easy access to my family photos. Anyway, this is for my personal account and I think that the method I now know could benefit programmers to view more than 1 or 2 files. But I have 0 coding experience and I simply need help! Please help, the features I enabled really messed me up. Thanks! ^ that is cool. Is there a way I can access my photos if I was able to reach 1 or 2 files though? No, not with that tool, at least. As far as I know, there isn’t any way to access private or password-protected content with any tool. I see. Well, I will continue to contact them and try retrieving my old content. If anyone ever figures anything out, let me know. I am supplying only one username (my username). Thanks! Hey Kulverstukas, I’ve done like you said with the url command. But I get an invalid syntax error which asks me to delete pb_shovel from the text. If I do that it asks to remove these “. Any help? Tried through cmd, and got this error ‘python’ is not recognized as an internal or external command, operable program or batch file. I run it and there’s no window or anything. Not even an ‘okay’ button. Worst ever. It’s not even written in Ruby. I want my money back. I dunno if the the PB account I tried to ripped from was empty or not. But I believe the PB account is a motherload. Unfortunately when I used PB_Shovel, no files were downloaded. More information is needed to determine anything, however it might be that, because the tool wasn’t updated for quite a while and PB probably changed their code around a bit. Works great. Thanks to Daapii for continuing the work. Do you mean I can’t download anything if I don’t have the password? If the album is private, you cannot download it without a password. Hi, when I installed python 27 then I unzip the master and put the 2 files into the master. Now when I click PB Shovel in order to input python command it disappears, what gives? is there a reason why it disappears when I open PB Shovel to into the commands? Read what has been said over and over again above. I read what you said and I understood the commands, thats not the problem, what I am asking is how can I get the PB_Shovel to start or should I be doing the command within Python.py rather PB_Shovel.